Design for Change! 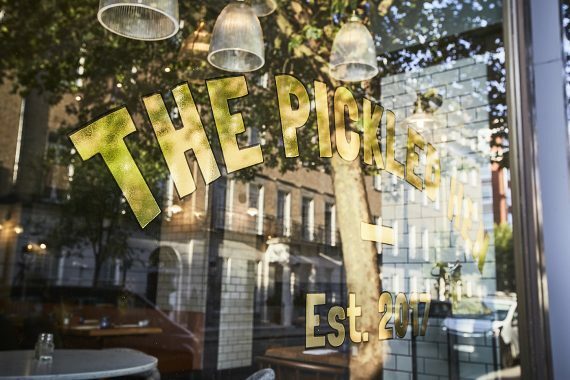 For the first time, Marble Arch London BID is taking part in the London Design Festival as part of the launch of Marylebone Design District, which celebrates the beautiful and brilliant design, food and drink in the eastern half of the BID area. We are thrilled that some of our restaurants are taking part. However, we are most proud to have fostered a relationship between our members – London Marriott Hotel Marble Arch, The Pickled Henand local homeless and trauma shelter, West London Mission (WLM), to showcase the meaningful and captivating art piece – ‘A Homecoming Wardrobe’ – made by clients of the shelter and charity during London Design Festival 15 – 23 September 2018. ‘A Homecoming Wardrobe’ is more than just a design and art piece, but a symbol of hope and community. 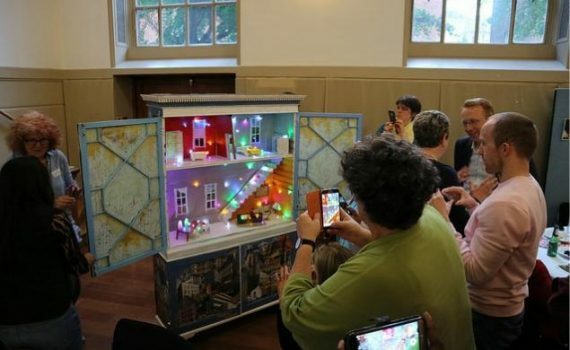 The piece is created by the homeless people, volunteers and interns at the WLM Seymour Place Community on Seymour Place to celebrate the success of WLM’s 2017-18 Night Shelter, which helped 84 homeless people to transition off our local streets with 61 of them accessing permanent accommodation away from the streets and 22 moving into employment. The piece centres around an abandoned wardrobe that was found by the manager of WLM. He immediately “fostered” the wardrobe, bringing it to WLM Seymour Place Art group, who have transformed this homeless, seemingly forgotten object into a medium that highlights their emotions and celebrates the success of the charity’s Night Shelter, which offers shelter, warmth and food throughout the cold winter months from October to May creating a stabilising foundation to help people access a range of opportunities for permanent transition out of homelessness. The wardrobe has 84 illuminated lights with each representing a life changed by the shelter’s work through the year. 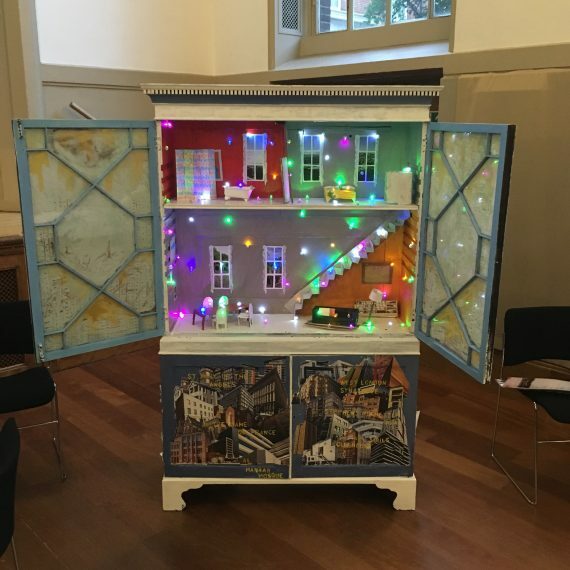 The piece is created to be ‘A Homecoming Wardrobe’ with external decorations highlighting expensive properties to show how tough it can be to financially sustain life in London, while the internal design features simple pleasures and home comforts that we often take for granted, like cosy couches, warm blankets and roofs over our heads. 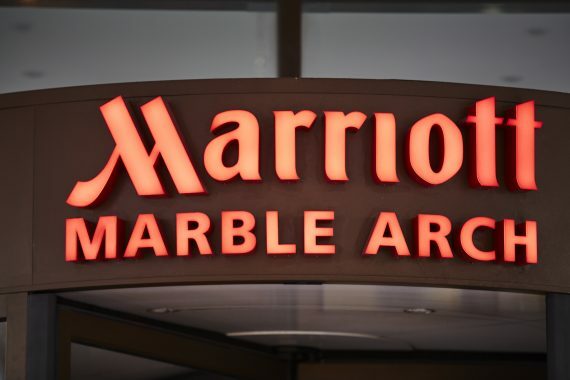 During the week of the festival, visitors can pop into Marriott Marble Arch to view the moving art piece, as well as visit The Pickled Hen for a 20% off when quoting ‘Marylebone Design District’. WLM Seymour Place work alongside 100 local homeless people per day providing food, showers, clothing, luggage, arts groups, access to accommodation and employment, physical and mental healthcare, and general fun and refuge from the chaos and danger of life on the streets for its vulnerable members.